The staff of the pousada gave us wonderful recommendations for what to do in Gerês: trails to hike, rivers to swim, horses to ride, traditional villages to visit, and culinary specialties to try. We greatly enjoyed these activities, but we also loved returning to the pousada at the end of the day to sit in the veranda and watch the sun bid farewell to the Gerês mountain. The Caniçadas hotel is part of a network of hotels called pousadas. 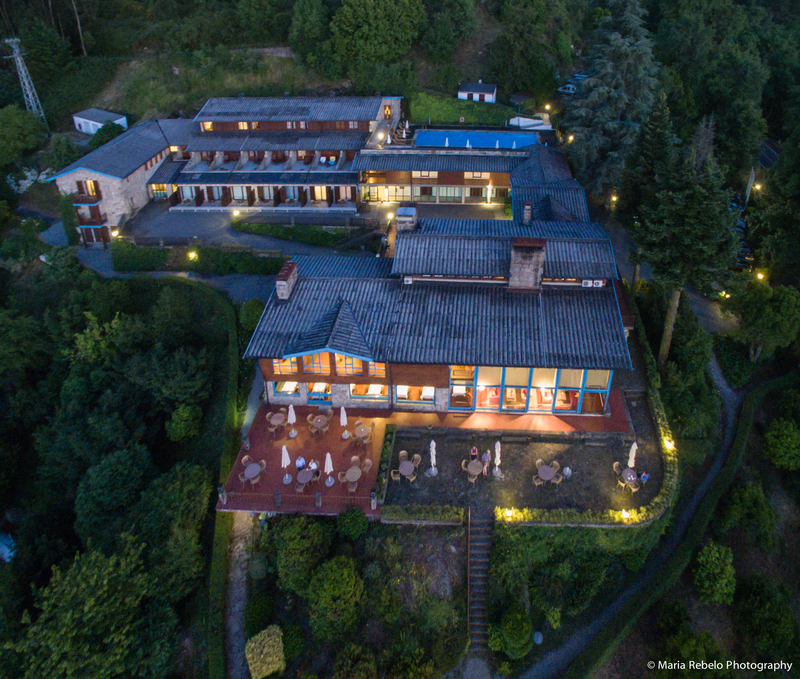 Click here for the pousadas’ website and here for a large collection of photos of the hotel. 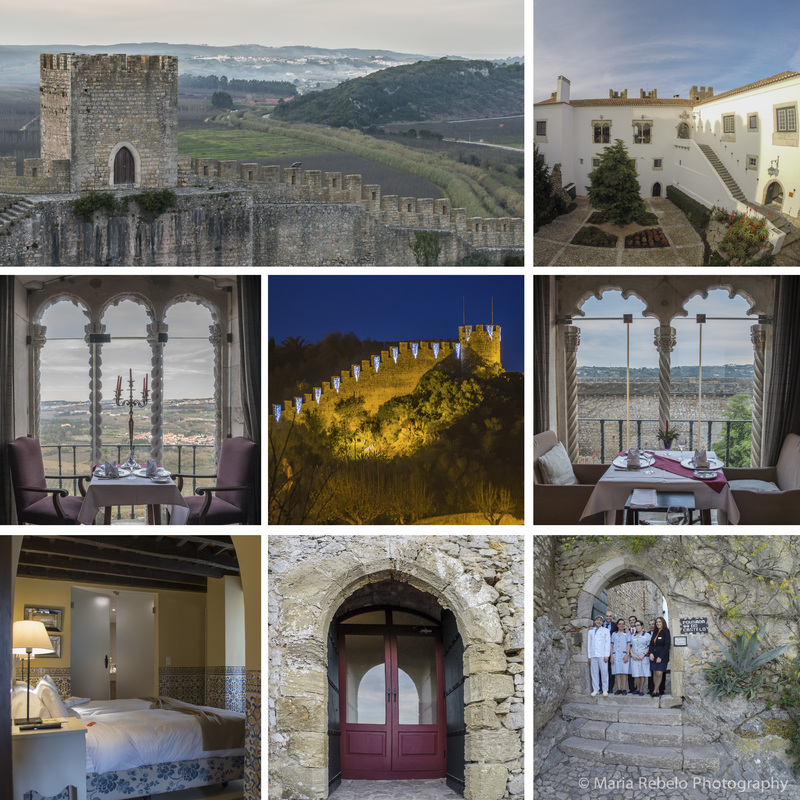 Our stay at Estoi was an extraordinary experience. Some days, we relaxed by the pool and spent time admiring the statues, fountains and myriad of architectural details. Other days, we went to the beach and enjoyed the pleasures of the sea even more than usual. For we knew that when the day was done, we would have our pink palace to return to. 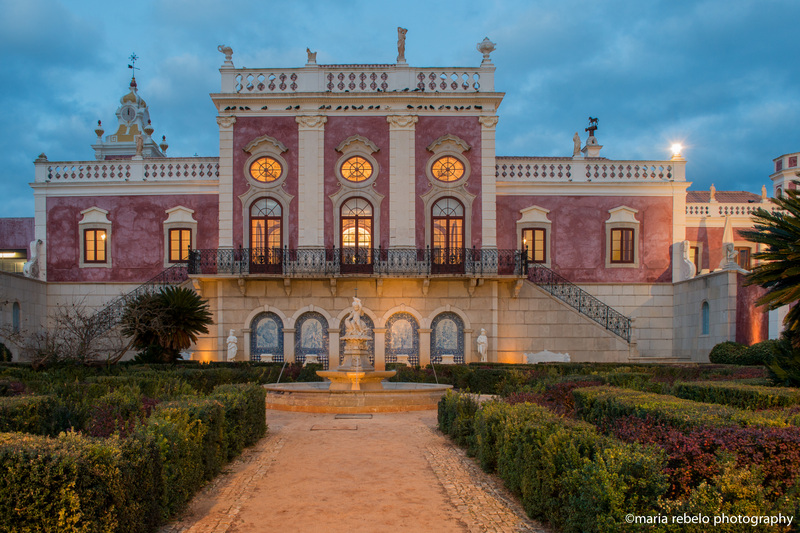 The Estoi palace is part of a network of historical hotels called Pousadas. Click here for the Pousadas’ website and here to see a large collection of photos of the palace. 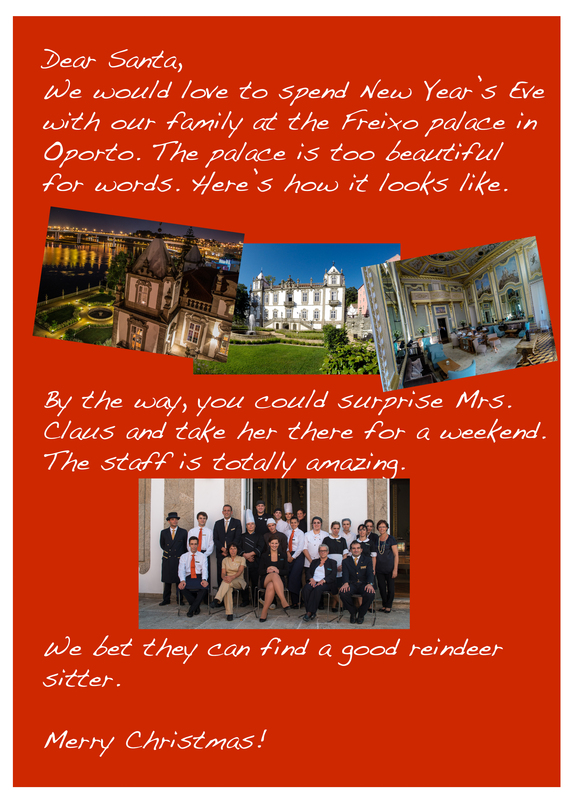 Click here for more information about the Freixo palace, here for more photos, and here for the hotel’s website. Some people climb the Kilimanjaro, others struggle to conquer the Himalayas. But you can feel on top of the world without hiring sherpas or buying oxygen masks. Simply drive to Marvão, a village on the São Mamede mountain, 834 km above sea level. We spent the morning exploring the ancient castle and walking the beautiful narrow streets. After working up an healthy appetite, we walked to the Pousada for lunch. The view from the dining room is absolutely stunning. We stayed for quite a while at the table mesmerized by the view. Seen from Marvão, the world below looks harmonious and the skies above divine. 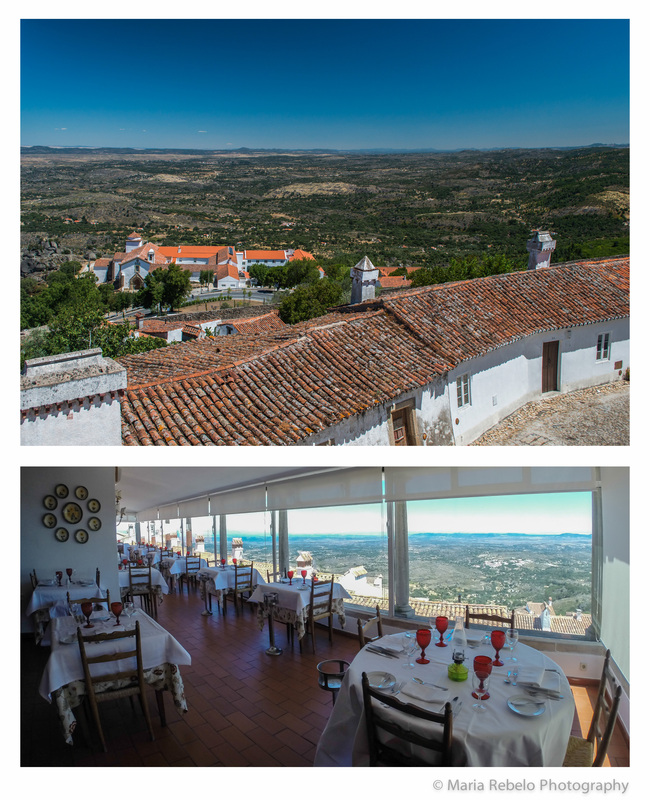 Click here for the Pousadas’ website and here for more photos of Marvão. 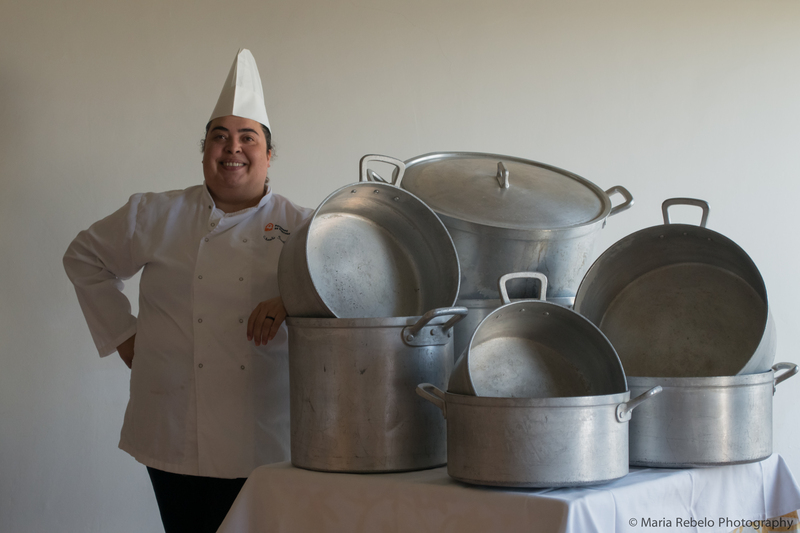 The dining room was full but Claudia Santiago, the chef at Flor da Rosa, kept her cool. She runs the kitchen like an orchestra conductor, making sure that the rhythm is just right and that all the subtleties of the cuisine of Alentejo are reflected on the plate. We asked Claudia whether she would share a recipe with our readers. She described several classic desserts but they were all too complex. So, we opted for the marinated rabbit recipe which is simple but delicious. Here it is. Cook the rabbit in a rich bouillon made with parsley, mint, cloves, and carrots. Then, grill it over charcoal for a few minutes to intensify the flavor of the meat. Shred the meat. To make the marinade, fry minced onion and garlic with a bay leaf in olive oil. Add vinegar. Combine with the rabbit and let it marinade over night. Decorate with peppers and carrots and serve. Enjoying this dish accompanied by Alentejo wine in the elegant dining room of Flor de Rosa, made us feel like lords of the manor. On the way to Flor da Rosa, a medieval castle converted into an historical hotel, we traveled through small villages lost in time and fields of cork and olive trees. 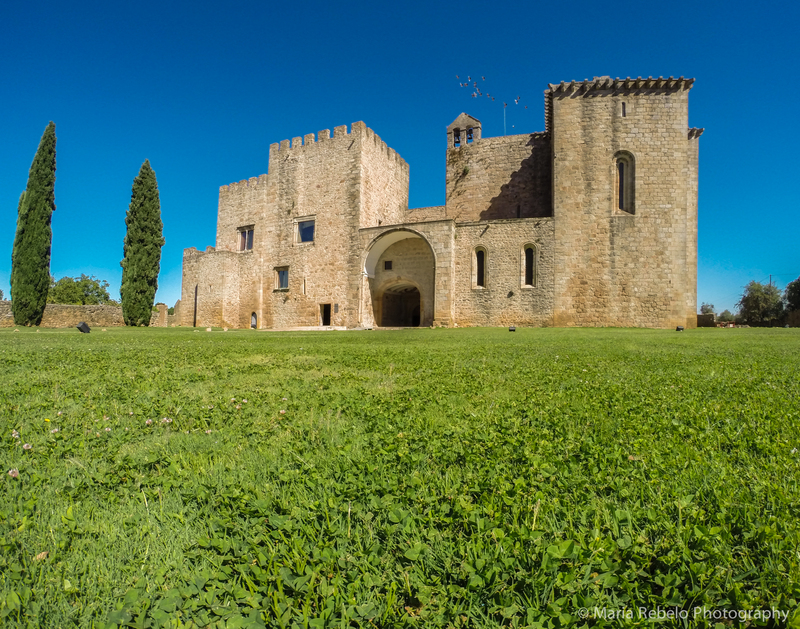 Nothing prepared us for the sight of the castle standing proudly on the Alentejo plain. The hotel has 24 rooms with beautiful views of the countryside and a swimming pool that overlooks the castle. The space is designed to offer guests great privacy. And the staff is so attentive that they made us feel like royalty. The next morning, we woke up in luxurious silence, far from the cacophony of modern life. We relaxed by the pool until it was time for lunch. We then headed to the restaurant where we tried some wonderful renditions of the local gastronomy: purslane soup, fish in coriander sauce, and marinated rabbit. These courses were followed by cheese from Nisa and Serpa. Our taste buds were celebrating these amazing gifts from the shepherds of Alentejo when a sampling of desserts arrived. They had uncommon names like “sericaia” and “encharcada,” and rightly so for everyday words cannot begin to describe these sweet creations. We had a great time sightseeing around Crato, the village where the hotel is located. In the late afternoon, the church bell reminded us that the sun would soon retire and that it was time to return to the castle. As we crossed the vaulted arches, we heard birds singing. These are the same sounds that were heard in the castle during the middle ages. Flor da Rosa is a precious time capsule that preserves the beauty of an age gone by.